"A high-flying Politician is not unlike a Balloon. He is full of inflammability, he is driven by every current of wind & those who will suffer themselves to be carried up by them run a great risk." Like hot air from a politician, blow-by air in a pneumatic conveying system is a fact of life that just has to be dealt with. There are some general misunderstandings about blow-by air, however, that can cause it to be misunderstood and even demonized unnecessarily. 1. There is a head of material waiting to come down and the material is a fine powder that tends to compact. This situation can tend to cause a “bubble bridge”, like a small balloon, above the feeder inlet, interfering with flow. In most cases this can be countered by placing a small fluidizing nozzle at the discharge to act as a pin prick to “pop” the balloon. 2. You have a small, closed area, non-vented device above the inlet. An example here would be a Bulk Bag or FIBC unloader as the material source. The problem here is once the air permeates the material, it has nowhere to go (picture Richard Gere in “An Officer & a Gentleman”). To counter this, most bulk bag unloaders are attached to vacuum systems. Where it is not possible, an intermediate vent hopper and isolation (like a secondary feeder valve above) can be used to vent air away from the bag discharge allowing it to freely flow. Keep in mind, these scenarios are the exception and not the rule. In actuality a more common issue in pneumatic systems design is to have customers worried about blow-by air when there is not a reason to be. Air going through a pelleted material coming out of a vented bin, can often times HELP material flow, not hurt it. You have to review the material and the entire stack-up as a whole to confirm where and when that is, though. 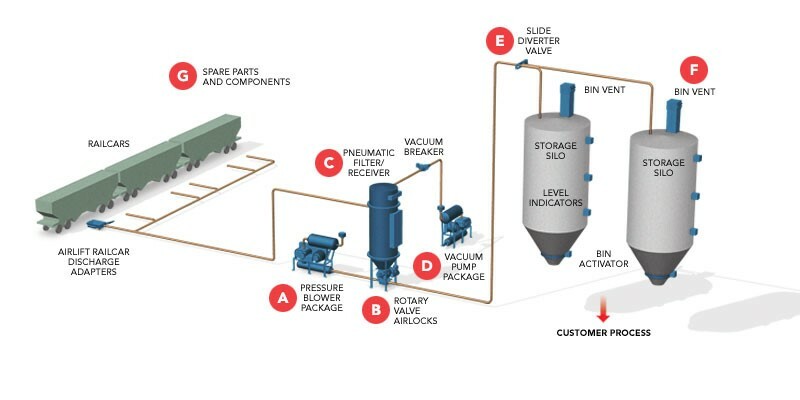 For More Information about Pneumatic Conveying Systems Click Here.